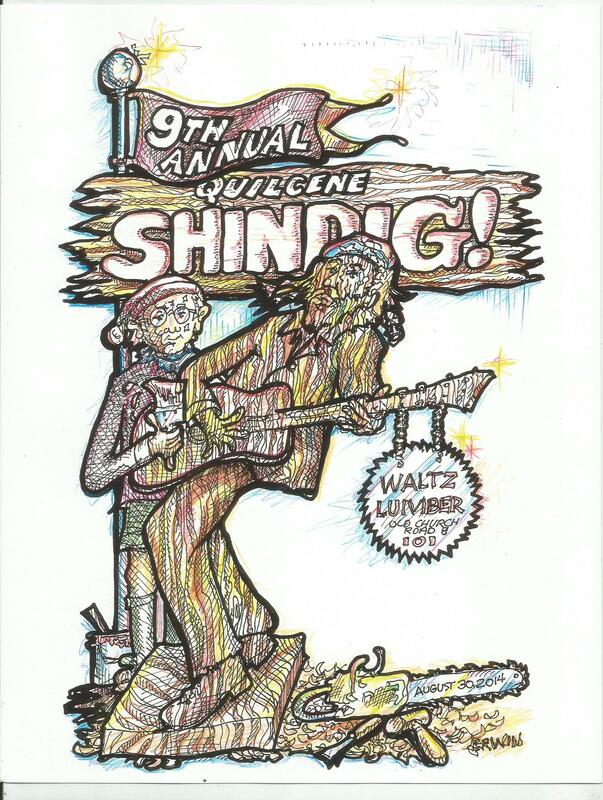 I was asked by musician Franko Bertucci (who heads up his touring band, Locust Street Taxi, participates in other musical groupings including “The Village Idiots,” and with his wife, Arianna, doing most of the work, has a small farm) to ‘draw up’ a t shirt design for the ninth annual “Shin-Dig,” a musical event in the town of Quilcene, Washington. If you’ve driven ‘the loop’ that US Highway 101 makes from down at the Columbia River, Chinook, the small town my Dad lives in, and go up the coast (sort of, more woods than waves), possibly making a detour to hit La Push, another turn at Sappho to check out Neah Bay, stay on 112 instead while heading toward Port Angeles, then head East and South; and you get to about mile marker 294, you’ll have passed my house and found yourself having to slow down once again for some small town before heading up and over Mount Walker and down the Hood Canal, the east side of the Olympic Mountains still on your right; well, that big curve is Quilcene, and exactly on the apex of that curve is where the Shin-Dig will be happening this coming Saturday. So, since the event is held just outside what was once a theater, next to what was once a church, on that curve was once the center of what was once a thriving lumber town, with a railroad line that actually cut across what is now my property, and that former theater is now home to Waltz Lumber, a business that sells slabs of wood (for things like coffee tables) and other exotic wood products (like maple for guitars and such), I thought it might be good to have a drawing of a wood carving (this is just in case you don’t get it from the drawing), and, since my son Jaymz (formerly J.J., actually James) is a lead guitar player and professional musician, I thought a wood carving of… anyway, the whole thing ended up looking more like a poster than a t shirt design, so… I did the black and white, got some copies, added some color and… poster. This entry was tagged Erwin Dence illustrations, Franko Bertucci, Locust Street Taxi, Quilcene Shin-Dig, Quilcene Washington events, real surfers, Surf Route 101. Bookmark the permalink.